1. Josh, this is the first thing you’ve written that has left me speechless (beyond stating that fact). 2. Oh well, thanks for the surgery, though, TJ! I prefer 1978 era John. I think I have the card for that somewhere. 4. 2 : Glad you mentioned the ’78 card. I did a post about it a while ago (see the Dodgers section in the sidebar) and was able to express (among other things) my admiration for his pitching. He was really fun to watch, I always thought. As for his current views, I guess I just had to vent about them. But I understand that it must be a case of once a competitor, always a competitor. To win 288 games you must have it in you to believe you can beat anyone, and that attitude must be difficult to put away after the games end. 5. 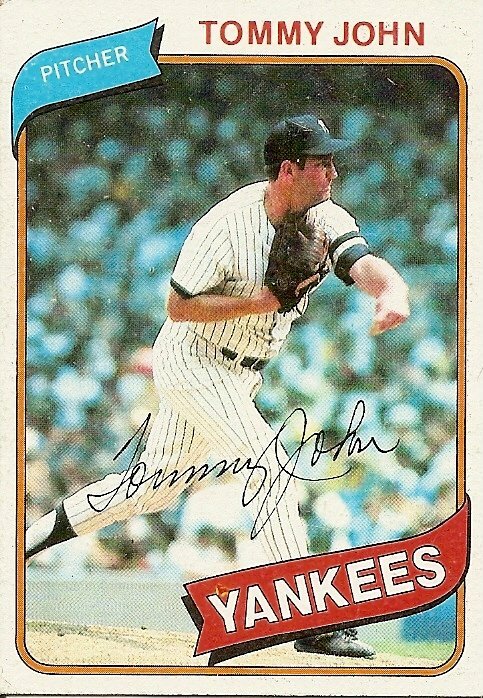 When Tommy John left the Dodgers for the Yankees, he said it “like going from a Caddilac to a Rolls Royce.” I put a curse on John that day and it paid off handsomely in ’81 when he was lifted in game 6 of the World Serious after a little over four innings of work, IIRC. I vividly remember John’s disgust in the dugout after being told he was being pinch-hit for–I can see it now, in front of me. He was incredulous, shocked, stunned. And we won. “We” won. I did not lift the curse. Now, TJ is ticked he’s not in the Hall. Fine. But given one game to win, or one season to win, or even a few seasons–say, five–I’d take Pedro on the mound and Pedro in the dugout. I’d take Smoltz on the mound and Smoltz in the dugout. I’d take Schilling on the mound and hold my nose when he got to the dugout. I’d take them all over you, TJ. If they retire and you’re still not in, you’re line just got a little longer. 6. I’m surprised, just because John always had the reputation of being a genuinely nice, sincere, straight-arrow kind of guy. The person Steve Garvey pretended to be, TJ actually was. 7. I guess my question with Smoltz, Pedro and Schilling is 20 years from now how will I remember them. With less wins than John, Martinez has a much less career era than John at under 3, but John’s era is better than Schilling’s and only slightly worse than Smoltz. John was an all-star 4 times, won 20 three times and had 14+ wins 8 times. Played in 3 of the more memorable World Series although never winning one. I agree with John that he should get in before those other guys. But I am not sure if I would vote for any of them ever. It is a good debate though. 8. 6 : I’ve heard that too and actually don’t see any reason for the radio appearance to change that perception; he just came off as a tad full of himself, a personality quirk that he probably shares with most succesful athletes and that seemed to cloud his judgment of pitchers that have come after him. 10. Tommy John and Jim Kaat…. both pitched above average (107 ERA+) for 25+ years. Does that equal Hall of Fame status? Does a few seasons of absolute, all-time greatness (like Pedro, 97-03) count more than a quarter century of above averageness? 11. 7 : I’m really not the guy to trust in an argument for Pedro, both because I’m biased and because my grasp of the concept of putting numbers in the proper context is pretty rudimentary. But Martinez’s superiority in career ERA becomes pretty gigantic when you consider that he pitched in a slugger-friendly era, a skinny maestro whipping all the steroidals from one bandbox to the next, while John had the benefit of a pitcher-friendly era in pitcher-friendly parks (the old Comiskey, Dodgers Stadium, Yankee Stadium for lefty pitchers). 12. 10 : Good questions. Pedro’s hopes rest somewhat on “The Koufax Precedent.” Unfortunately for him, he has, unlike Koufax, allowed people to see him in decline, so the golden aura that had been around him for several years has faded a bit. 13. Why can’t grumpy old players just fade away? Tommy John, regardless of HoF status, will live on in baseball history forever. Anytime some little kid asks his dad ‘what’s Tommy John surgery?’, there’s a 26 year, 288, 3 decade story waiting to be told. I’m sure there are even folks who assume the guy IS in the HoF. I’m too young to appreciate the TJ era, but if I grew up a fan of TJ, I’d be disappointed with this. Much like if Pedro, 20 years from now, griped about his HoF status I would be equally disappointed. There’s something to be said about dealing with the cards dealt. Pedro may not be a HoF, but he is EASILY the greatest living pitcher I’ve ever watched. The most entertaining guy to watch in his prime. His dominance played a huge role in developing my love for the sport. The Yankees won 3 straight championships, and Pedro struck out 17 Yankees in the middle of their run. 17! It’s not like he was facing a team that would lose 95 games(like Clemens’ 20Ks v. the ’86 Ms) or 106 games(like Clemens 20Ks v. the ’96 Tigers). There should be a Grumpy Pants Hall of Fame for guys who really really want to get in. 14. 11 Those are great points Josh. That tilts it towards HOF for me. In my previous post I nearly wrote that “I probably would vote for Pedro,” because looking at his dominant seasons, they are pretty similar to Koufax’s numbers. Both had 3 Cy Young awards and were absolutely deserving of those awards. Pedro, like Koufax, pitched his teams into the playoffs and without them, those teams probably are not playoff teams. Pedro had absolutely dominant seasons, but the tough thing for him is playing during the career’s of Maddux, Glavine and I guess Clemens. Maddux had several sub 2 era seasons and Glavine was consistently well under 3 or right around 3. I doubt we will ever see pitching again like Pedro, Maddux, Glavine or Clemens exhibited. Especially considering I doubt that Pedro, Maddux, or Glavine ever used steroids. 15. 13 That would be a very crowded place. 16. Nope?! NOPE?!?!?! Good gracious, Pedro is so manifestly a HOFer that a dismissive “Yep” is the only rational reply to the question. His peak performance towers over virtually every other pitcher in the history of the game. Just to display my own bias — if there is to be a litmus test for pitcher enshrinement, I’d like it to be just above the (enormous) head of Schilling. If you were better than Schilling, you’re in. If not, tough cookies…. 17. SB, I commend you on the curse. Tommy went from a Caddy to a Rolls…to a Bentley: In 1988, John made three errors on one play, the first pitcher to make three in one inning since 1898, when the feat was performed by James Bentley “Cy” Seymour. 18. 16 : I hear you on Schilling. I haven’t scrutinized his numbers (i.e., skimmed the conclusions of some reliable Jamesian who scutinized the numbers), but for some reason I certainly wasn’t as aghast at John’s denial of his credentials as I was of the denials of Smoltz and, especially, Pedro. I think his postseason work has to count for something, and he was among the elite starters for quite a while. I predict a lot of newspapermen will lump him in with Jack Morris; my guess is that his contextualized numbers are better than Morris’s. 19. For this kind of discussion, I like to turn to Jay Jaffe’s work (Baseball Prospectus). Jaffe addresses the Peak vs. Career (Re: comment 10 ) by simply averaging a rating for Peak and a rating for career. (Those ratings: take the context-adjusted Wins Above Replacement scores for each season and add them up, top 7 seasons for Peak). What I like about this method is that it help see the difference between the era the players played in (by using translated WARP scores), and so you don’t have to know how a 2.59 ERA in 1974’s NL with a home park in Dodger Stadium compares to a 2.89 ERA in 1998 in Fenway. (Turns out the latter is much, much better). Either way, it reveals John to be over-valuing Wins, and undervaluing everything else in the analysis — something I don’t blame him for, though, given that in the age in which he pitched, Wins were king. Also, considering he gives the thumbs up to Glavine and down to Martinez, he John seems to be evaluating career contribution over peak — again, something I don’t blame him for, since he’s likely to be biased that way given that he had a long career. It is easy to note, however, that of all the pitchers entertained in that interview, John’s career stacks up below all of them, even below the average hall of famer, both in terms of peak and career total. So despite the fact that I have an autographed baseball with Tommy John on one side and Steve Yeager on the other, it is clear to me that John isn’t in the same class as the others. 20. 19 : Very interesting. Thanks for that. My first thought was that John was getting penalized for having a relatively modest peak, but he actually ranks lower than all those guys just using the career number alone. The one thing that surprised me was Schilling ranking slightly ahead of Smoltz. I wonder why I would have guessed it would have been the other way around. 21. 19 Nicely done on the analysis; very well said, to boot. One day, I’d like to write a post like that. But until then, I’m going with pure emotion as logic requires research (at least a clicks worth) and some work. 22. That might be the first person I’ve seen put Glavine in before Smoltz. 23. The question is not whether Pedro Martinez belongs in the Hall of Fame, but whether he is the greatest pitcher who ever lived. And I have do disagree about the Koufax principle. Like any good Dodger fan, I love Koufax, but Pedro is/was far, far better. Martinez had a better peak, a much longer career, and was a good pitcher for a greater proportion of that career than Koufax was. 24. 23 One day, someone should do a simulation on what the Dodgers would’ve been like if we had kept Pedro Martinez. How would history be different? The Dodgers of the 90’s were seen by Rob Neyer as huge underachievers. What would they have been like with Pedro? We’ll never know, of course, but is it not interesting to surmise? 23 …I love the place in history Koufax has, but in terms of translated numbers, he shows up poorly against these standards. Even by peak, his numbers (probably because of the translation of figures in his era) aren’t as impressive as Randy Johnson’s. Pedro, according to these numbers, is clearly behind Maddux and Johnson, and those guys pitched in the same era, even. But you need to go with your gut on some things, like: Sandy Koufax was the best lefty ever, and Pedro might have been, for a time, the best ever. None of this means I don’t think Koufax belongs in the Hall, but I guess I’ll let the numbers tell me that Tommy John doesn’t, and most, if not all of the above shown in the analysis, do. 26. 23 : I love the Pedro-love. I have to hesitate a little to agree with the claim that he was “far, far better” than Koufax, but like most people I have had Sandy on a pretty high pedastal for a long time. Since we’re discussing numbers, here’s a thought for people who know a lot more about this kind of stuff than me: It seems to me expansion eras would enhance the numbers of great players. I think this is generally acknowledged to be the case for hitters. But what about pitchers? Do the best pitchers also benefit from the infusion of mediocre bats? I first started wondering about this during the 1990s, when Maddux, Pedro, Clemens, and Johnson were putting up their ungodly numbers. 28. 27 : That was great. They actually seemed to be really warming up with Ebbets Field memories when it came to an end, and I wished it had kept going. 29. Does a few seasons of absolute, all-time greatness (like Pedro, 97-03) count more than a quarter century of above averageness? 30. Tommy John ranks 20th all time in innings pitched, 25th in wins, 8th in games started, 26th in shutouts. His career ERA was more than a third a run beter than his league average, and his ERA+ was 110. He also had a postseason record of 6-3 and postseason ERA of 2.65. I don’t think longevity and competence alone deserve entry into the HOF, but I think John will be one of the best who doesn’t get in. Smoltz ranks behind John in IP, Wins, Starts, and Shutouts, had a postseason record of 15-4, and also had a postseason ERA of 2.65. But Smoltz’s ERA was half a run a game better (compared to league average) than John’s, and his ERA+ was 127 (49th all time) over the 81st most innings pitched. John is wrong that he deserves HOF before Smoltz. Smoltz did not have quite the longevity of John (assuming Smoltz is retiring) but his bar of excellence is much higher. If John deserves to be in the HOF, so does Smoltz. Curt Schilling was slightly better than Smoltz compared to his league average ERA. He went 11-2 in the postseason with a 2.23 ERA. He’s 14th all time in Ks, second all time in K to W ratio, and just a hair better than Smoltz in ERA+. If Smoltz deserves to be in the HOF, so does Schilling. Bert Blyleven’s ERA+ was 118, not quite as good as Smoltz or Schilling. Blyleven’s postseason record of 5-1 was almost as good as Schilling, slightly better than Smoltz, and better than John’s; his postseason ERA of 2.47 is also not quite as good as Schilling and better than Smoltz or John. Blyleven is 13th all time in innings pitched, 5th in strikeouts, 9th in shutouts, and completed more games as a starter than Smoltz has complete games and saves combined. Blyleven threw almost 50% more innings than anybody named by Tommy John except Tommy John, or 7-10 additional seasons of 200+ innings at well above league average performance levels. Everyone with more innings pitched is in the Hall of Fame, everyone with more strikeouts (and everyone retired going back seven spots, with Maddux, Schilling, Martinez, and Smoltz not yet eligible but in the mix at 11th, 14th, 15th, and 16th) is in the HOF, and everybody else in the top 20 in shutouts is in the HOF. Blyleven got jobbed out of at least one Cy Young award (leading the AL in ERA+ and shutouts in 1973, 4th in IP, and had almost 30 more innings pitched than Palmer, but Blyleven only finished SEVENTH in CYA balloting). In 1985 he led the AL in Ks, Shutouts, IP, CGs, and was 6th in ERA+, but Saberhagen, 59 fewer IP, won the award. In 1977 Blyleven was 2nd in ERA+, 2nd in shutouts, led in WHIP, and got zero votes for Cy Young, while Sparky Lyle (13-5, 26 saves) somehow won it. For whatever reason the sports writers didn’t take to Blyleven while he was active, and then cite his insane lack of Cy Young consideration for why he doesn’t belong in the HOF. IIRC, there was a study that Blyleven has more undeserved losses because his team didn’t hit than any other pitcher in history; with average run support, he’d have 312 wins. Taking those things under his control, there is no justification for him to not already be in the HOF. Pedro Martinez is the all time ERA+ leader for a career with 400 more innings pitched than Sandy Koufax. Unless he gets proven to have bet on baseball (and what was he doing, betting that he’d pitch great that day?) there is no possible justification for keeping him out of the HOF. Tommy John really wants to be in the HOF, and he did some things that matter a lot longer than did Smoltz, Schilling, or Martinez. But what matters most is quality, and of the pitchers John named, he is clearly the weakest. Blyleven will probably get in next year (long overdue), Martinez will be a first ballot inductee, and I’m not sure about Schilling or Smoltz. I’d give Schilling the nod for the bloody sock, and I wouldn’t vote for Smoltz because, lets face it, so much of his career he was the #2 or even #3 starter behind Maddux and Glavine; it’s a lot easier to pick up wins when you aren’t facing the ace. Even the presence of Don Sutton (lots of above average innings, career ERA+ of 108) does not mean that John deserves to be in. Sutton is 7th in Innings Pitched, 7th in Ks, 10th in shutouts, 3rd in games started, 14th in wins. If Tommy John gets into the HOF it would not really offend me; after all, he’s right on the edge, and in a way his groundbreaking surgery was directly responsible for, say, Gagne’s Cy Young award, and who knows how many other seasons or careers of excellence. And I liked John; he was a smart player who played to his strengths and overcame a lot of injuries, and Bill James once identified John as a given type of successful major league pitcher. But I wouldn’t vote for him myself. 32. 30 That was interesting, thanks. There are, however, three things you mentioned with which I feel compelled to disagree. 1) The first is the same thing Josh pointed out, about Smoltz not being deserving because he was a #2 or #3 starter. As Josh mentioned, Smoltz’s status as the #3 starter had essentially zero effect on the pitching matchups. After the first week of the season, teams’ rotations no longer match up with each other, and if they do, it’s by coincidence (i.e. a 1-in-5 chance). 2) Being the #2 or #3 starter is nothing to be ashamed about when you’re talking about a rotation that was by far the greatest in the history of baseball (as Bill James and many others have stated). One’s status as a Hall of Famer shouldn’t depend on the number of great teammates one has. It should depend on the player’s own performance. And Smoltz, in actuality, was the Braves’ #1 starter more often than you give him credit for. He was also the only player to be around for every season of what was one of the great dynasties in baseball history. 3) While I support Blyleven for the Hall, I strongly disagree that his postseason record (5-1, 2.47) is better than Smoltz’s (15-4, 2.65). 5-1 is a better percentage, sure, but a 15-4 record is infinitely more difficult to achieve, and far more valuable to boot. Blyleven’s record is an artifact of sample size. Do we really believe that if his opportunities were tripled, he would go 15-3 with a 2.47? Of course not. Also, while Blyleven’s raw ERA is better, Smoltz actually has a significant advantage in postseason ERA when offensive contexts of each era are taken into account. 33. I’m late to this party, but I wanted to add that John worked a couple of the Yankees games for the MSG network back in the early ’90s and every third and fourth word out of his mouth was “Tommy John.” He spent more time talking about himself than the game. I’m not even sure I’m exaggerating (and yes, he used the third person). I wish I had a tape of it. Needless to say, he didn’t last in the booth beyond those few games.